I will go over Enchanting in Legion from a gold-making point of view. Enchanting has usually been a great goldmaking profession, due to the nature of enchants. People are continuously getting gear upgrades throughout the expansion, and demand will be high. I will only be looking at the Legion recipes here. Currently my total profit for my enchanting group is about 60k according to TSM, but that includes an inventory of about 130-150k in mats and enchants. I recently scaled up my enchanting operation significantly and sales are constant. I have sold enchants for 70k a day on average the last week. I have created a spreadsheet where you can input your recipe levels and the material and enchant prices on your realm to give you a quick look into whether or not you can craft enchants profitably. It should be fairly self explanatory, just change the cells with prices and recipe rank. The process for enchants is very simple. I’ll go through how i go about each of the steps to mazimize my profit. Sourcing enchanting materials cheap enough is the most important part of ensuring a profit from enchanting. If you have access to Leatherworking, Tailoring or Jewelcrafting you have the ability of sourcing large amounts of Leylight fairly easily, and you should look into it. For JC it is rings with uncommon gems, just find the cheapest recipe that creates blues from your profession, and see how the price of crafting it stacks up to buying Leylights. Also, remember that you can shatter Leylights into 3 Arkhana. This is generally the most cost effective way of getting Arkhanas in my experience, although your server might be different. Mass crafting and disenchanting will also give you some Chaos Crystals, but it will not be nearly enough. Gettinc Chaos Crystals cheaply is the single most important part of turning a profit with enchanting. The price of Crystals is very volatile compared to a lot of other materials, as supply is lower and more uneven than for items that can be reliably mass-crafted. Supply comes from both crafters and World quest rewards as well as raids and dungeons. Buying from the Auction House is usually viable, in terms of getting cheap enough crystals. 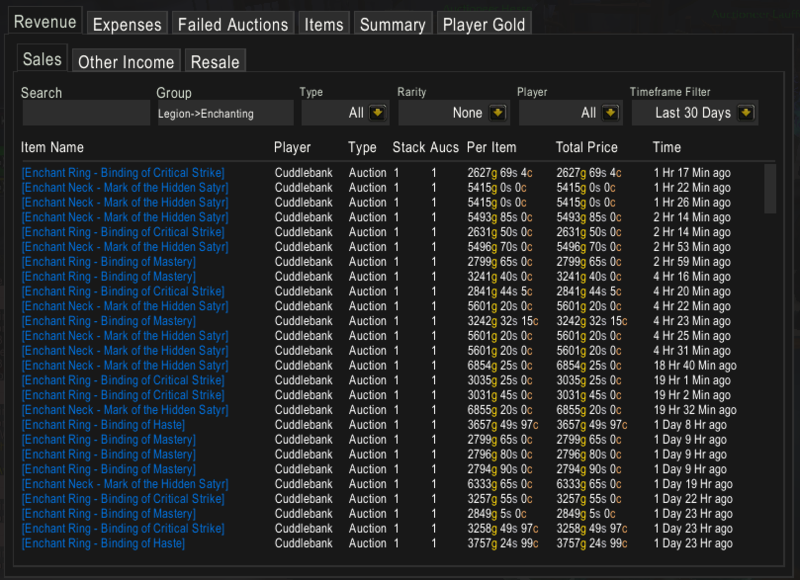 I do however strongly recommend making a trade chat macro where you advertise a price below the AH price. This has the effect of decreasing price expectations and you will get people biting that just want the gold fast. You can check out my how to here on how to make it, or just copy the one i wrote just below here and edit in your preferred price. It is important to note that the supply of Crystals can be very heavily influenced by changes in the game. I generally try to not overcommit as the prices are still trending down on my server. Crafting is obviously very simple, just click create and use it on an Enchanting Vellum so you can sell it on the Auction House. Vellums are sold by tons of vendors all over Azeroth, including in the Dalaran Enchanting shop. The trick is to craft what people are actually willing to buy. There are three types of enchants in Legion, for Rings, Necklaces and Cloaks. From a gold-making point of view I will be focusing on the Enchants that cost Chaos Crystals, not the cheap ones, as the market for non-BiS enchants is much smaller, and at current prices I think the majority of players are OK with paying for the BiS enchants. The Cloak enchants give +200 mainstat (Agility/Strength/Intelligence). If you mass craft them you should easily find the balance based on how fast they sell. The Cloak enchants are the only ones that require Bloods of Sargeras. As such you should compare them carefully to whatever other use you can put the Bloods to. I find that my Bloods are better spent on Epic Gems, so I can’t vouch for the profitability of the cloak enchants. Ring Enchants give +200 to a secondary stat (Haste, Crit, Mastery, Versatility). All of these stats are BiS for some specs, so I suggest crafting them all, and recrafting whatever sells out fastest. Rank 3 is obtained from exalted with Nightfallen and Dreamweavers, and is worth 15 arkhanas per enchant, which quickly stacks up. You can earn money with Rank 2, but rank 3 is quite a bit better. The Neck enchants give various completely different procs and buffs. The Mark of the Hidden Satyr is BiS for all DPS specs as far as I can tell, so this is the most popular one by far. Rank 2 will make you competitive and you can get rank 2 as a drop from Shade of Xavius in Darkhearth Thicket, so run that. Mark of the Traines Soldier gives +300 mastery and is generally BiS for Healers and Mark of the Heavy Hide is generally BiS for tanks. The other enchants currently are not BiS and are unlikely to be large sellers. As there are way more DPS than healers and Tanks, I strongly suggest prioritising mark of the Hidden Satyr. It is my biggest earner by far from enchanting. I personally post 1 enchant of each type at the time. Undercutting is fairly fierce so spending some time canceling and relisting can be well worth it. Most importantly demand is super high on raid-reset day. To maximize your profit it is very important to have enough inventory on raid-reset to really churn them out. Enchants sell well throughout the week as well, but the prices tend to go down slightly before spiking up a bit on wednesday/tuesday. The reason i use 100% crafting is that i know that I source my materials below the valuation TSM sets for them. If you like to tinker with your price settings, or feel more unsure about your aquisition cost i suggest reducing it to 90% or 85%crafting. I uploaded my groups to pastebin here, so go ahead and import them. I have not included Shopping operations as I only buy Chaos Crystals in bulk from the AH, and source my Leylight and Arkhana through crafting. I welcome any criticism or feedback on my guide, spreadsheet or Groups. Anyway, good luck, and happy selling. Hi. Sorry for my late response but I tried again in the next day and it worked fine.